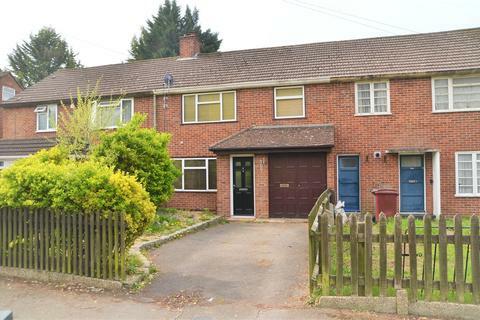 An excellent opportunity to purchase this extended three bedroom semi-detached home set in a pleasant cul-de-sac location on a level plot and within catchment for both Westwood Farm primary and Denefield secondary schools. Extended on the ground floor, the property features a 20ft living room, 15ft L shaped kitchen/dining room with French doors opening to the garden, study/playroom, (which has been used as an additional bedroom) along with a ground floor shower room. Upstairs are three bedrooms and a family bathroom. 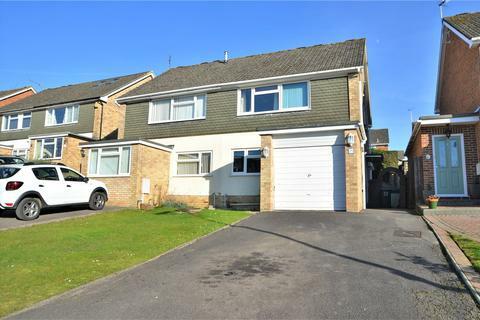 To the front there is ample driveway parking, a very private and enclosed garden to the rear, along with gas central heating and double glazed windows. Situated within walking distance of local shops, Cotswold sports centre and also within walking distance of Tilehurst railway station. Viewing recommended. Entrance Hall - With radiator, stairs to first floor. Living Room - 6.25m x 3.78m max (narriwing to 2.54m minimum) (20 - A dual aspect room with feature fireplace, two radiators, door connecting to kitchen. Shower Room - Comprising a white suite with shower cubicle, wc, wash basin, radiator. Kitchen/Dining Room - l shaped 4.75m x 4.34m max (narrowing to 1.93m min - Fitted with a comprehensive range of base and eye level units, integrated oven and hob, integrated dishwasher, space for fridge/freezer, plumbing for washing machine, ample space for table and chairs, rear aspect window overlooking garden and double glazed french doors opening to garden, radiator. First Floor Landing - With access to loft, side aspect window. Bedroom One - 3.58m x 2.87m (11'9" x 9'5") - With front aspect window, radiator, range of fitted wall to wall wardrobes. Bedroom Two - 2.87m x 2.57m (9'5" x 8'5") - Rear aspect window, radiator, cupboard housing gas central heating boiler. This room also enjoys a pleasant elevated view across the surrounding area. Bedroom Three - 2.67m x 1.96m (8'9" x 6'5") - With front aspect window, radiator, fitted wardrobe. Bathroom - Comprising bath with fully tiled surround and electric shower over, wc, wash hand basin, radiator. Outside - To the front of the property there is ample driveway parking for several cars. To the rear is a private enclosed garden with area of patio leading onto an expanse of lawn. Property reference 28633103. The information displayed about this property comprises a property advertisement. OnTheMarket.com makes no warranty as to the accuracy or completeness of the advertisement or any linked or associated information, and OnTheMarket.com has no control over the content. This property advertisement does not constitute property particulars. The information is provided and maintained by Patrick Williams - Tilehurst. Please contact the selling agent directly to obtain any information which may be available under the terms of The Energy Performance of Buildings (Certificates and Inspections) (England and Wales) Regulations 2007 or the Home Report if in relation to a residential property in Scotland. 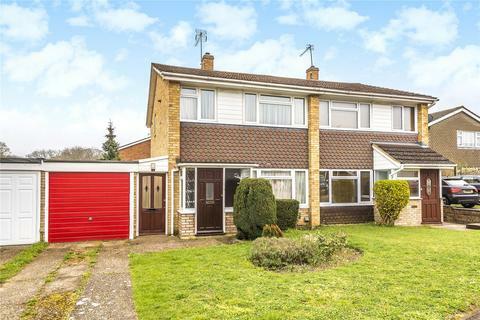 PARKERS - Offered with "no onward chain" complications is this extended three bedroom semi-detached house located on the sought after "Birds" Estate.